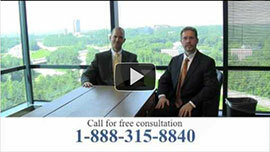 ← Do You Need Help Suing an Insurance Company? Personal injuries are unfortunate accidents that occur under various circumstances, and they must be addressed by an attorney with proper credentials if you expect to be awarded compensation for your injuries. The personal injury lawyers at Link & Smith, P.C. help clients get the settlements they deserve, and can do the same for you. If you work in a hazardous environment, then your employer should have the proper precautionary measures in place to ensure the safety of you and your co-workers. However, if an injury occurs due to inadequate safety measures or faulty maintenance of the work facility, the organization could be liable for your injuries. Automobile accidents are one of the most common causes of personal injury in Georgia, especially in the Johns Creek area. There are car accidents, motorcycle accidents, and tractor-trailer accidents each and every day that result in serious injuries for the person(s) involved. We provide you with the assistance you need to handle your personal injury case quickly and get results fast! One of the most common types of personal injury is medical malpractice, or negligence on the part of a surgeon, physician, or other medical professional. Not only can this cause serious damages (and even death), but also can increase the patients’ expenses quite substantially. In both situations, the patient could file a claim against the medical facility that is responsible. If you live in Johns Creek or the surrounding area, and need an attorney to represent your case, come see us today! We specialize in all types of personal injury claims, and have helped several clients achieve 6- and 7- figure settlements for their injuries. If you want to pursue a settlement for your injuries, then please call us at 404-315-8840 to speak with one of our lawyers today! This entry was posted in Blog, Personal Injury Attorneys and tagged personal injury, personal injury compensation, personal injury lawyers. Bookmark the permalink.